Endoscopy Market size is set to exceed USD 40 billion by 2024; according to a new research report by Global Market Insights. Increasing geriatric population in developing countries such as Japan, China & India will act as highly impacting factor for endoscopy market growth. Elderly people are highly susceptible to suffer from chronic conditions due to poor immunity thereby leading to increase in demand for minimally invasive endoscopy procedures. According to National Home Infusion Association (NHIA), nearly 92% of elderly people suffer from at least one chronic disease while 77% suffer from 2 or more chronic diseases thereby accelerating endoscopy market business growth. Rising incidences of gastrointestinal diseases such as constipation among geriatric and pediatric population will stimulate industry growth over the forecast period. Development of innovative endoscopy devices have resulted positively in adoption rate of these devices. Frequent upgradation of technology allowing introduction of several types of endoscopes such as capsule endoscope applicable in diagnosing diverse types of diseases including colon cancer screening will drive endoscopy market. Development of cost-efficient disposable endoscope has promoted ease and convenience for performing endoscopy procedures that has enhanced market growth in developing economies such as China. However, dearth of skilled endoscopists and physicians to perform endoscopy procedures will hinder growth of endoscopy market over the forecast period. Endoscopes accounted for largest revenue share in 2017 due to rising prevalence of chronic conditions such as cancer and gastrointestinal ailments coupled with technological advancements in endoscope enabling minimally invasive endoscopic surgery. Minimally invasive procedure offers several benefits including reduced hospital stays, less blood loss due to smaller incisions, lower risk of long-term surgical scars, faster recovery and higher patient outcomes, thus fueling endoscopy market growth. GI endoscopy segment held more than 40% industry share in 2017 and is anticipated to follow similar trend in upcoming years owing to increasing cases of ulcers. Gastrointestinal disorders require continuous monitoring and accurate diagnosis, that can be achieved by utilizing endoscopy devices will drive segment growth. Moreover, water related infections highly prevalent in Asia Pacific leading to increasing incidences of gastrointestinal disorders will boost industry growth. U.S. endoscopy market will witness 6.4% CAGR during the forecast period owing to increasing number of baby boomers suffering from chronic gastrointestinal disorders along with rising prevalence of colon cancer in the country. Also, growing rates of surgical procedures that require endoscopies to aid diagnostic decisions will have positive impact on industry growth. Germany endoscopy market was valued over USD 1.7 billion in 2017 due to continuous integration of advanced technology in the endoscopy devices and high technological adoption. Increasing cases of cancers such as colon, ovaries and kidney will further boost endoscopy market growth in Germany. 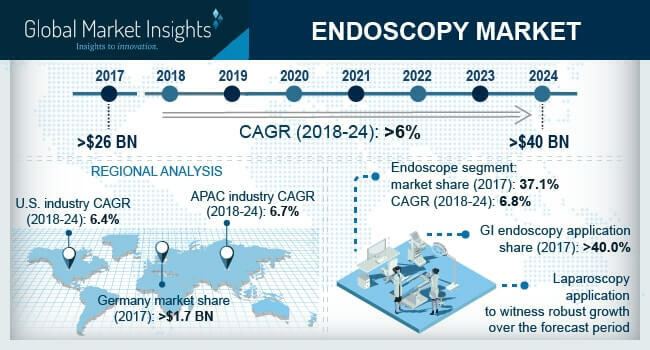 Major industry players operating in Endoscopy market are B.Braun, Boston Scientific, Conmed Corporation, Cook Medical LLC, Ethicon US, LLC, Fujifilm Corporation, Hoya Corporation, Storz, Medtronic, Olympus Corporation, Richard Wolf GmbH, Smith & Nephew PLC and Stryker. Key industry leaders have been focusing on R&D to provide superior quality endoscopy devices in the market. In December 2017, Pentax Medical, a division of Hoya medical announced launched of HD duodenoscope with disposable distal cap for expansion of its endoscope product portfolio. Inorganic growth strategies such as strategic partnership and collaboration is also undertaken by market players to sustain market position and gain significant market share.